We are in the middle of a fundamental transformation of the global order which is challenging the supremacy of the USA, and to a certain extent of Europe, in economic and also in normative terms. The financial crisis has further accentuated this shift in the post-Cold War architecture, with emerging economies becoming an engine of globalisation. 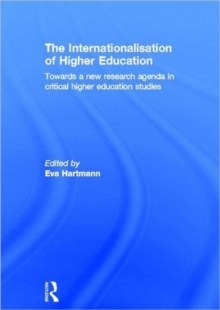 The chapters in this volume shed light on the role of higher education and its internationalisation in this context, focusing on the different regions of the world. The new role of international organisations like UNESCO is also examined. The empirical findings of these studies are part of a new research agenda in higher education studies, one that goes beyond a `higher educationism' limiting itself to a simple description of institutional changes in this sphere in the light of internationalisation. The different case studies advance an interdisciplinary perspective, drawing on accounts from critical and postcolonial theory, international relations and international political economy. This perspective sheds light on the strategic selectivity of the transformation and the struggles related to this major transformation of higher education and its contribution to a new global architecture. This book was originally published as a special issue of Globalisation, Societies and Education.